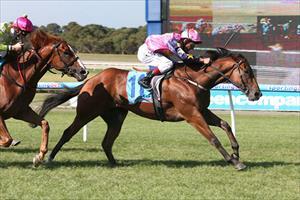 He was laughed at as a younger horse, but cheered home at Sandown on Wednesday. De Little Engine raced to his first city win and set up a potentially big few days for his owners. “He was a horse that, hence his name De Little Engine, was tiny as a baby and he was laughed at in the stable when he first came in,” trainer Danny O’Brien said. De Little Engine races in the same colours as stablemate Shamexpress who will go around as one of the favourites in Friday night’s Group One William Reid Stakes at Moonee Valley. Shamexpress will also be ridden by Damien Oliver who steered De Little Engine ($26) to a one-length victory over Zedeel ($7.50) with the same margin to Lady Anthenaeum ($19) third in Wednesday’s 1800m race for three-year-olds. O’Brien said De Little Engine, out of Oaks-winning mare Arapaho Miss, had been building to a win and the gelding’s fitness told in the finish after the field was strung out midrace by a genuine speed. “He’s rock hard fit and he has been racing really honestly,” O’Brien said. O’Brien can’t wait for Friday’s $400,000 William Reid and expects Shamexpress to be hard to beat. “He’s drawn well, he’s got D Oliver on and hopefully we can get over the line,” O’Brien said.